In the broadest sense, social marketing includes everything from publishing blogs, to knowledge sites like Quora, and even online groups. We want to talk about measuring your impact when it comes to social networks like LinkedIn, Facebook, and Twitter. Historically, measuring your PR and social marketing efforts weren't easy. This was until Google started measuring impressions and click-throughs. Since then, these measurements have also trickled down to social networks. But when it comes to social networks, there are more than just these two metrics that you can track. We've compiled a list of metrics that you can measure. We also noted how helpful these metrics are and how easy they are to capture with traditional social media management tools. This section describes the total number of views that a single piece of content receives. Impressions tell you that someone saw your post in the feed. It doesn't guarantee that they looked at it. Below is an example of how LinkedIn shows impressions as 'views' shown below your specific post. This metric indicates the number of people in your audience who have clicked on your content. Once you know the number of click-throughs and total impressions, then it's easy to calculate your click-through rate (CTR). To calculate your CTR, divide the total number of impressions by your total number of click-throughs. Click-throughs are helpful. It means the user clicked on your content. Ultimately, they left his or her social media feed to view your content. That's one of the highest levels of engagement you can expect. This metric just tells you how many people are following your profile or company's page. By itself, this is not very helpful. Companies reach less than one percent of their followers with their content. It's not guaranteed that someone will see your post just because they follow you. For example, Facebook's algorithm prioritizes content that encourages meaningful connection and conversation. Additionally, Facebook will show "less public content, including videos and other posts from publishers or businesses." First degree people are those who have a direct connection with you on social networks. These people are your profile or brand's followers. Second-degree connections are people who are connected to your first-degree connections. By including second-degree connections in your network, you will reach a high percentage of your connections with content. 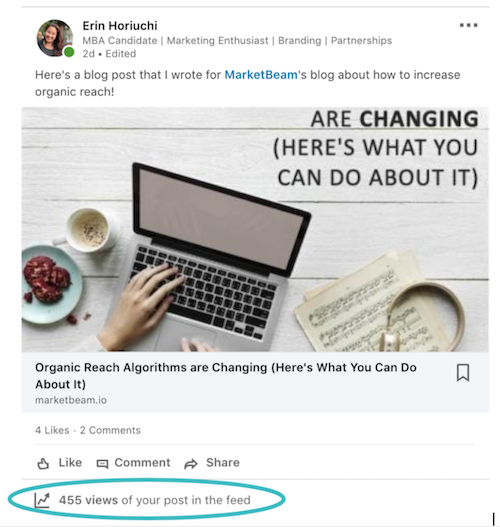 If the content is liked, shared, or clicked on by your network then your posts will show up more frequently to your network. There is no way to know in advance how many people you can reach through posts. It's hard to gather this information over a period to study trends across posts and social networks. Also, it's difficult to tell what type of content your audience likes. Do they like blog posts, images, videos, articles, or a diversity of content? If you knew what they preferred, then you could produce more of what they like. With data from MarketBeam, you'll have an aggregated view where you can learn how to cater to your audiences' preferences. It's helpful to know where your audience is located. This knowledge indicates where your social traffic is coming from. You can also tell where potential prospects or consumers may be located geographically. If you want to reach a certain geographic area, the best bet is to find influencers or partners in that region who can post your content. Consumers these days have multiple social media accounts. The median American uses three to eight social media platforms. It's no surprise that Facebook and YouTube are the most popular. It's helpful to know which social media networks your audience prefers. With this knowledge, you can cater your content to your audience's preferences. Thereby increasing the chances of your content being seen. With a tool like MarketBeam, you can track the evolution of your audiences' preferred content type and social network. You can also look at your campaign efforts over the last month or quarter and view where your audience is located geographically. Most importantly, you can use the tool to amplify your content. You can amplify content by using your executives' and employees' social networks to reach beyond your brand's followers. Want to Learn More About Social Marketing Metrics? To learn more, register for WITI's webinar on November 28th at 12–1 PM Pacific, where Pushpa Ithal, CEO and founder of MarketBeam will share her insights on how to measure your campaign impact. If you're not a WITI member, register using promo code webvip1128 to attend free of charge. This article was originally published on MarketBeam.